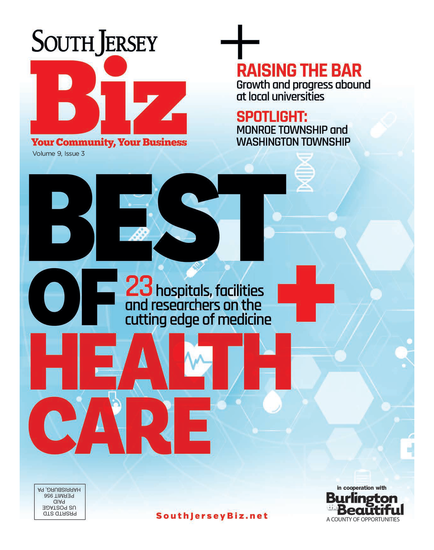 A record-breaking amount of nominations for our third annual Best of Biz contest has resulted in our largest list yet of the top names in South Jersey business. You voted—and we heard you loud and clear. Here, we present 90 organizations, both readers’ and editors’ picks, in dozens of categories—from the mainstays every business owner needs like the most-trusted names in banking, insurance and computer services, to more specific services such as daycare, event planning and executive coaching. Gold Gerstein Group, the result of a merger between Gocial Gerstein, LLC and Gold Meltzer, LLC, has grown significantly since Meltzer joined his father-in-law’s business in 1961. What was a staff of three accountants is now 16 partners strong with a staff of about 35, offering services out of their Moorestown and Voorhees offices from general to forensic accounting, business valuation to pension administration and more. Their reach extends from Maryland to New York, and the company is also one of 125 firms part of Integra International, which extends their services globally. Andrews Federal Credit Union began in 1948 at Camp Springs Army Air Field (currently Joint Base Andrews) in Maryland and has grown to more than $900 million in assets serving more than 105,000 civilian and military personnel around the world. Locally, there are branches in Burlington, Mount Laurel and Joint Base McGuire/Dix/Lakehurst—and you don’t have to be in the military to join as the credit union is open to employer groups and individuals. “We are a part of the community we serve from our active duty, reserve guard, and retired military to the residents who make South Jersey their home,” says Maree Duncker, Andrews Federal Joint Base McGuire/Dix/Lakehurst branch manager. The credit union had one of its best performing years in 2012 by adding nearly 7,000 new members and more than doubling its loan portfolio. Plans this year include releasing their SmartSuite of products: SmartConnect (online banking), SmartPay (online bill pay) and SmartCall (automated telephone banking). Additionally, the credit union will introduce SmartMobile to make managing money even easier. With top-notch facilities, food and entertainment options and an ideal location, The Hotel ML in Mount Laurel has established itself as the spot in South Jersey for your business meeting. It’s no wonder, then, that companies continue to come back time and time again. The Hotel ML has 20 meeting room combinations and 14,000 square feet of meeting and banquet space, with plans to add even more space this fall. There is also an audio-visual company on the property, and for those clients that need to stay overnight, there are 281 guest rooms, the Coco Key Water Resort for families and Talia’s Restaurant and Bar. If scheduling lectures at your convenience, taking tests when you feel ready and benefiting from one-on-one interaction with an adviser sound like your idea of school, then it might be time to look into online education. And the Rutgers – Camden School of Business Executive Education program should be at the top of your list when selecting a school. Rutgers has been offering online certificates for more than 10 years, and currently has more than 30 different certificate options to choose from. The most popular include project management, human resources and accounting/finance. The program is ideal for professionals looking to advance in their field, switch careers, or start their own business. A facilities-based telecommunications company with a corporate office in Marlton, Xtel Communications provides voice, Internet, data and cloud services to the enterprise, education and government market sectors. The company, which will celebrate its 20th anniversary in 2014, is on track to increase revenue by 20 percent in 2013, which is directly attributed to their successful Ethernet product line and hosted PBX services, according to Brian Flynn, vice president of operations. Sensational Host Caterers, a second-generation business based in Maple Shade, started out as a small retail outlet in Delran 32 years ago and has grown into one of the Delaware Valley’s leading caterers. The company offers their services for everything from your child’s Bat Mitzvah or wedding to a business luncheon, grand opening or fundraiser. But it’s the love of the industry itself that President/CEO Henry Gosik says has led to its success. Sensational Host holds between 25-40 events a week. To maintain their growth, ongoing staff training is a priority. The company is planning on a significant expansion in the next two years, including a new facility that can seat 650 and will include cooking classes and a full-time sommelier to help clients with menu choices. “We invest in our employees, which gives us a superior product culinary wise and service wise,” Gosik says. “Ancero takes pride in being a full-service provider of technology products and services to businesses of all sizes,” says Ancero’s Executive Director Robert Hogg. Since 1996, the Mount Laurel-based company has been helping large and small businesses with managed services, VOIP, data and cloud-computing solutions across the Delaware Valley. Ancero has also played an integral role in assisting medical organizations with secure data center solutions that will keep the system running even if disaster hits. “We strive to deliver outstanding value through our full-service approach and exceptional attention to each client’s individual needs. In every aspect of our performance, we focus on serving the needs of those who entrust us with their business,” Hogg adds. In 2013, Ancero plans to expand its role as an AT&T Partner Exchange Platinum Solution Provider. It will bundle services with AT&T to provide customized choices for customers that will help manage everything from servers in the cloud to end-user devices. South Jersey Energy Solutions, which is part of South Jersey Industries, operates a number of subsidiaries that provide customers with environmentally friendly energy solutions that help control energy costs. According to Dan Lockwood, manager of public relations, these subsidiaries provide total energy management services to commercial and industrial facilities, operate on-site energy projects such as thermal facilities, as well as natural gas storage and transportation to wholesale customers. In terms of renewable energy projects, the subsidiary Marina Energy, which specializes in solar energy, recently completed expansive solar arrays for several New Jersey businesses, including Fed Ex and L’Oreal. Horizon Blue Cross Blue Shield of New Jersey has grown from an insurance provider to a medical institution in our state. As the oldest and largest health insurer, the company has provided health insurance benefits to the area for more than 80 years. Currently with around 3.6 million customers, it’s been a busy summer for Horizon Blue Cross Blue Shield of New Jersey, which welcomed a new vice president and chief medical officer, Dr. Mark Calderon, this month. The company spent the last few months reaching into communities around South Jersey, as well as keeping up with health care reform updates and news. And Blue Cross isn’t taking the reform lightly, preparing its clients with detailed information on everything from improved benefits to women’s preventive care. It’s the extra outreach that’s helped them grow to become one of the most well-known names in health care in New Jersey, as well as in the country today. When it comes to this law firm, partner John C. Eastlack Jr. credits the years of experience shared among their partners and attorneys for their success and prestige in the field. Eastlack is one of 13 partners at the firm who, along with managing partner Walter Weir Jr. and several associates, provide a full range of services from aviation to real estate. But it’s their expertise in the financial industry that retains clients including major banks and mortgage companies who rely on them for a variety of financial transactions, acquisitions and more. Weir & Partners looks forward to providing more of what’s given them their standout reputation. “I think the firm is focused on continuing to do what we do well, which is to continue to serve our clients well,” says Eastlack. Office Basics How does a company like Office Basics, now in its 25th year, grow to have five separate locations with a full force of designers, drivers and salespeople? Office Basics serves the Delaware Valley and parts of Maryland, but in the upcoming year the company is looking to expand into Baltimore and the Washington, D.C. area. A three-generation, family-owned company based in Cherry Hill, ACCU Staffing Services has offered risk-free staffing options to businesses throughout the greater Philadelphia region since 1979. With clients ranging from small, local businesses to national, Fortune 500 companies, ACCU Staffing’s services provide enormous cost savings in labor and relieve companies of many other human resources burdens such as recruitment, assessment, verification, employment taxes, benefits, handling employee relations, job training, and compliance with federal and state laws. Sid Benstead and his associates at The Sid Benstead Team of Prudential Fox & Roach Realtors in Marlton work with clients that are purchasing office space, industrial properties, multifamily investment properties or their dream home. TTI Environmental, Inc. may be headquartered in Moorestown, but it provides a wide range of environmental services throughout the country. Founded in 1985, it serves business, industry and government agencies in a number of areas, including environmental consulting, industrial hygiene, construction and contracting, storage tank management, environmental health and safety, and more. The key to the firm’s long-standing success is the staff’s expertise and experience in all of these diverse fields. In an industry that’s always changing, TTI stresses the importance of staying educated on regulation issues and industrial complexities and understanding the need for change. “With over 50 environmental licenses and decades of experience, our professionals routinely design and implement solutions, helping clients to meet and exceed compliance standards and to better position themselves for tomorrow’s markets,” Durand says. Charny, Charny & Karpousis, P.A. Published (and copyrighted) in South Jersey Biz, Volume 3, Issue 8 (August, 2013).